and ideas for making wreaths and topiaries from plastic Easter eggs. LOVE the creativity i see out there! but.... what if you don't celebrate Easter? or what if you just want a more subdued palette? (and good company, to be honest... pastel eggs are NOT my thing. 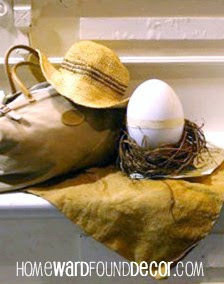 for creating spring decor with un-decorated eggs! 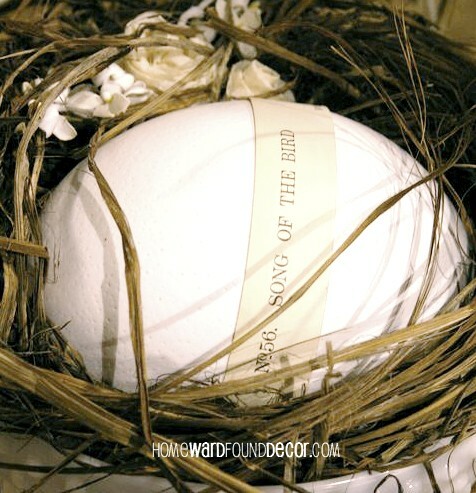 some are real, and some aren't.... use papier mache', clay, wood, or ceramic eggs. first up, an ostrich egg (HUGE) embellished with a strip of vintage sheet music. then sat the nest on a 'pedestal' of an upside-down milk glass lamp shade (with the narrow end up). and this works perfectly when you are using real (blown) eggs, because they are protected. forget to blow the eggs, and then seal them in a jar. 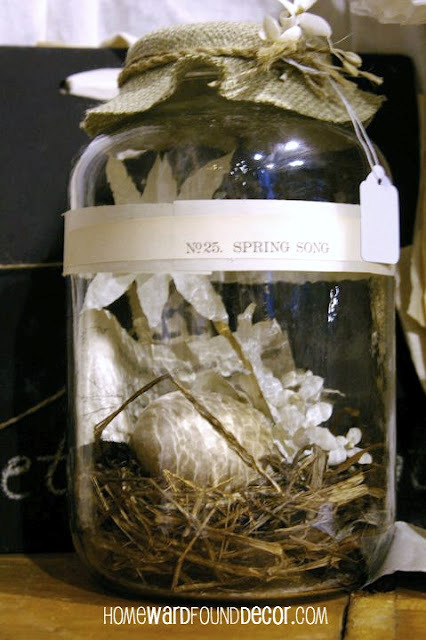 a little nest of grass is placed in the jar and an egg nestled into it. and a strip with an appropriately 'Spring-y' title is glued onto the jar as a label. i also covered the jar tops with a scrap of burlap, tied with twine. [i use pickle or olive jars from thrift stores. 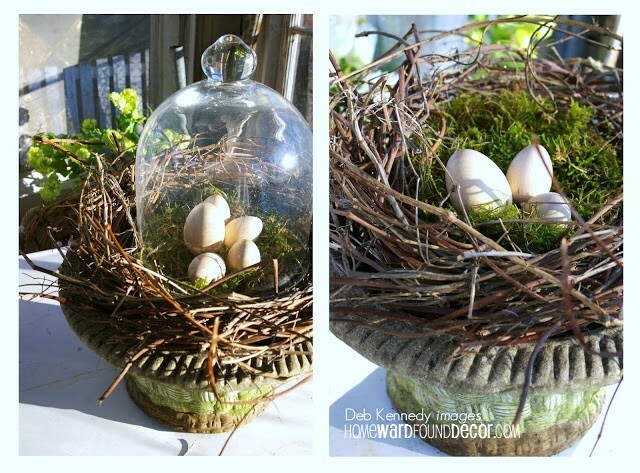 this LARGE handmade nest sits atop an aged garden urn. moss from a corner of the yard fills the center of the nest, providing a soft resting place for a few eggs. a glass garden cloche finishes off the look perfectly. and a clear stemless wineglass as a 'dome' will finish it off with style. 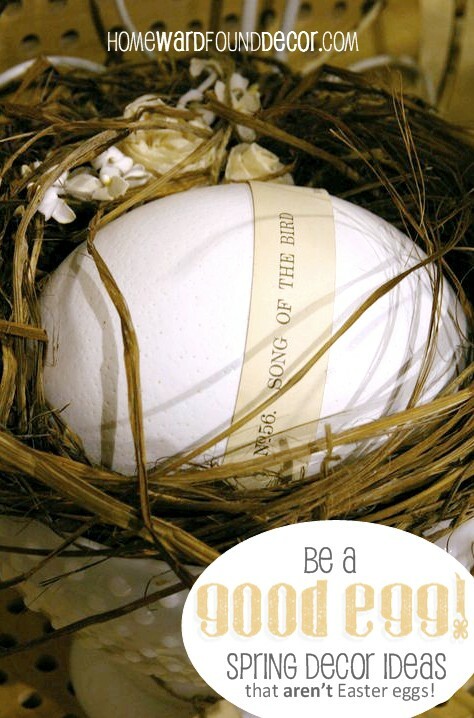 if you write each guests' name on the egg, these are perfect place cards! that i'll be sharing here on the HOMEWARDfound blog later this week. in the Spring issue of Creating Vintage Charm magazine! Ah Deb, you do scare me sometimes. I've had a row of crystal salt cellars, with my silver eggs sitting on top, for a few weeks now, just waiting for me to take pics and post them on my blog. A simple idea, yet so elegant. 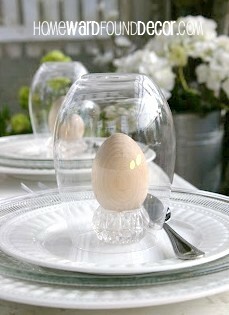 My favorite was the egg s under the overturned glass.